I have after market pillar posts that were adhesive to my old ones due to syn damage, with these still work with them? 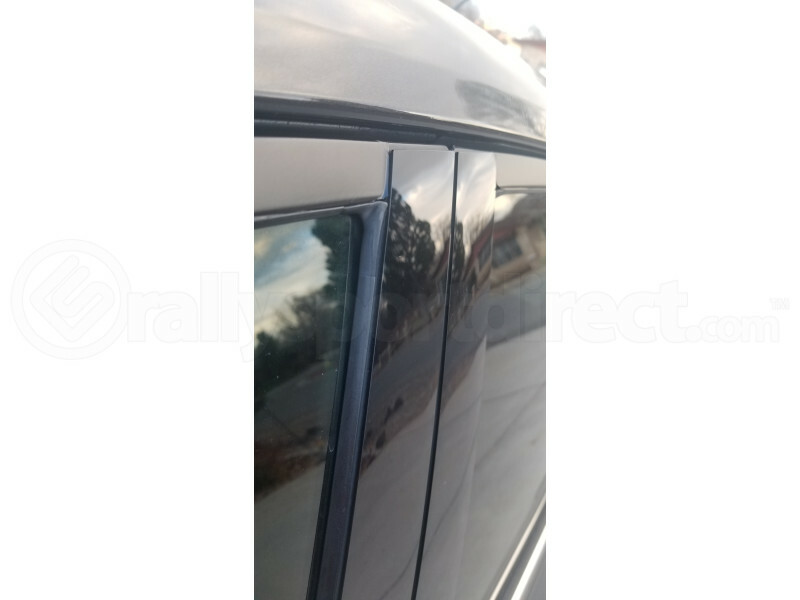 A: It was hard to see if those pillar posts were flush with the window trim but it looks like they are and so you should have no problem installing these rain guards. will this fit a 2013 subaru wrx hatch? A: Yes these will fit. A: Drilling is not required for installation, the clips will use a double sided tape for the installation. Hello, will this fit 2008 Subaru Forester 2.5T? A: Unfortunately, this is not confirmed to fit your vehicle. Will this fit my 2018 Wrx? A: No they will not. Will these rain guards fit my 2008 subaru impreza wagon? Questi deflettori vanno bene per Subaru WRX STI SEDAN 2011? Grazie! A: These will work for your 2011 Subaru WRX STI Sedan. Can this be use for STI 2015 model? A: These are not confirmed to fit your car. Will this fit on 2015 sti? A: We cannot confirm fitment for the 2015 models at this time. A: The clips install behind the seals, and the adhesive is included as a second attachment. What percent tints are the rain guards? Are these in channel or are they just taped to the outside? A: They attach to the outside with clips and double sided adhesive. Will these fit on a 2010 wrx sedan ? A: Yes they do as per the listing under the Confirmed application. Hi, I was wondering if the rain guards that I purchased only comes with just 4 clips? Because I recently got my item shipped and it only came with 4. But as noted in the directions, I need at least a total of 8. Can you please clarify that for me? Thank you, I appreciate it! A: They will come with 8 clips. Just given the nature of how they are packed it looks like only 4, but when you open the pack it would be 8 in there. what part of the door does it get glued onto? A: These will mount to the top of the door frame at the top of the windows with double sided tape. Are the air deflectors stuck on to the car with double sided tape or does it slide up into the window? A: Yes these are held on with double sided tape. If these correct steps and processes are taken when installing these they will not fall off if that may be a concern. A: Yes we are showing that this would fit that application.